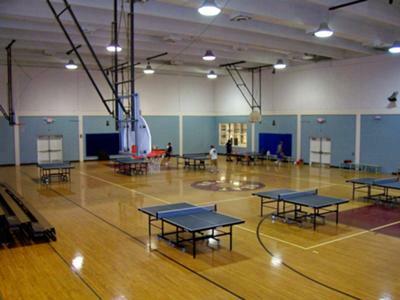 Pensacola Table Tennis Club is located at 901 N. "E" St., Pensacola, Florida 32501 USA. The Fricker Community Center is located just one block North of Cervantes and parking is inside the fenced area just past the Baseball field on the left. We are open Mondays and Thursdays from 6-9pm unless there is a holiday or some other special event. In that case I always send out emails to all the local players of such. Monday nights is for "Family Fun Play". Bring your kids and your mom and dad for a fun night of family play. We offer coaching but we do not have any full time coaching so it has to be part of our regular practice times. Thursday nights are for the more advanced "Athletic Play". If you want some fast moving exercise, come join us and get your cardio vascular work out from 6pm until 9pm on Thursdays. There is plenty of room and tables for all levels of play, so come in and join the fun on which ever night you can make it. 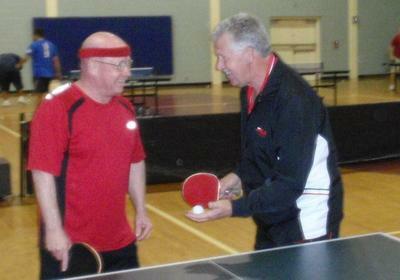 Our club is a USATT sanctioned club with Certified Referees and players from the Beginner level to the Advanced level. We are a non-profit club and invite any one who loves the game as we do to come play with us. We have been an USATT affiliated club since 1996 and have been growing ever since then. We started out with only 3 tables and about 8 players. We now have 13 tables, 2 robots, and over 400 names of players and visitors in the Pensacola area. We have about 20 good regular players ranging in USATT ratings from 800 to 1800 and those numbers are rising with more players and practice. We are a fun club based on the premise that if you don’t have fun, why are you playing? Visitors are “always” welcomed to our club. As a matter a fact, we have the word out that if any organization wants to put on any table tennis event for fund raisers or whatever the reason, the whole city or county has been informed to send them our way. We help them organize, advertise, and run the event to the benefit of their organization and of course our club. The more people we get to come play is a win:win situation. They get more donations and we get more players. It has worked well for us now for 12 years. How much does it cost to play at our club? Recently we started a One Dollar “ball donation” for adults only. Children are free to come play as long as they behave themselves a little and have fun too. We recently started upgrading our tables and as such we now have 6 Donic Persson 25mm tables and the remainder (not replaced yet) are Butterfly Match Rollaways. We have sufficient lighting to see well, air conditioning and wood floors. We usually play with white balls but the robots use orange balls. We also put up barriers for tournaments but only a half court barrier during regular practice session nights. We usually have 20+ players on Thursdays but Mondays are usually 12+. As mentioned Mondays are for the fun play and lessons during the first 30 minutes of the night but we still have a mixture of beginner to advanced players. We host 2 USATT sanctioned tournaments a year (January, June/July) and a variety of non-sanctioned fund raiser tournaments (usually, April, August, October) and any time someone else wants to host one for their cause. We try to maintain the fun atmosphere at our club. We want our youth to grow in our sport. Parents tell me that their kids have told them “This is more fun than video games”.